We started the afternoon’s climb towards camp with Volcano Lanin rising tall and snow-capped behind us. I was teaching Mariano, the youngest gaucho in the group – 15 years old and sharp as a tack – the difference between ‘to have’ and ‘to be’ in one of our now regular, informal language lessons; our horses nuzzling each other as they lazily strode out in the sun I thought of relevant examples – ‘I am a girl, I have a horse’, ‘ahhhh, bien, I am a gaucho I have 25 horses?’ was his unblinking response – lest I forget! Warned it was going to be an ‘up-hill’ day I wasn’t prepared for the thrilling mouth-of-dust-gallop this particular morning offered. 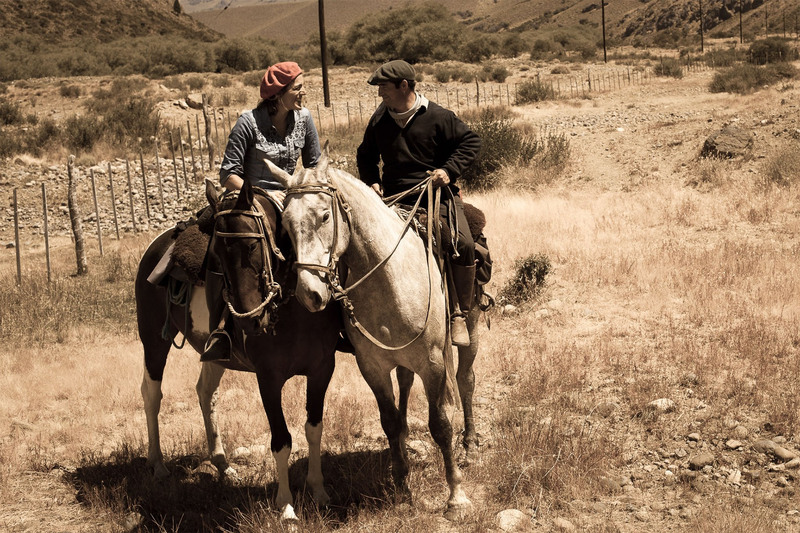 Thrilled, wide-eyed with exhaustion and rather hot we arrived at a river and de-camped in a tree-dripped hollow in time for a siesta – with most days tipping 8 hours in the saddle siestas became a necessary pleasure, although certainly taken for the horses rather than us. 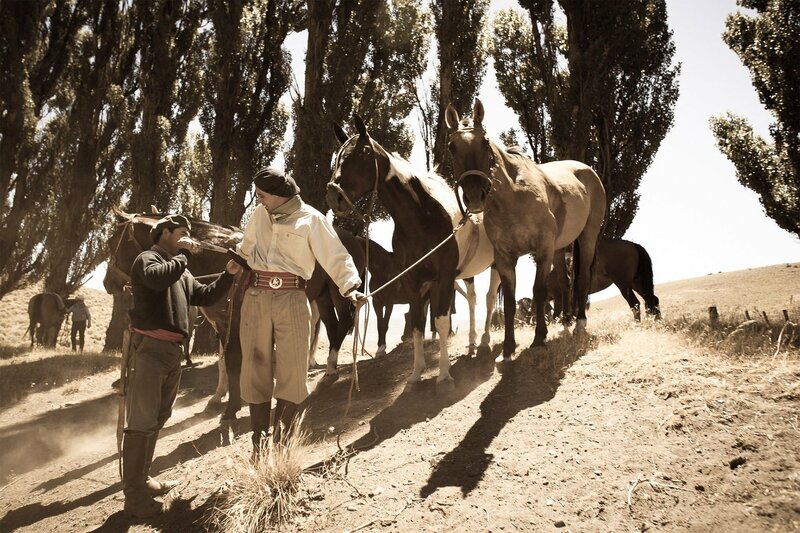 In the vastness that is Patagonia the gauchos know where to find water for their horses, the love they have for their animals unparalleled. Upon reaching rivers the animals are the priority; metal tins are untied from the back of saddles and using these water collected from the river is gently poured over the steaming noses and run carefully along the strong backs of our steeds. 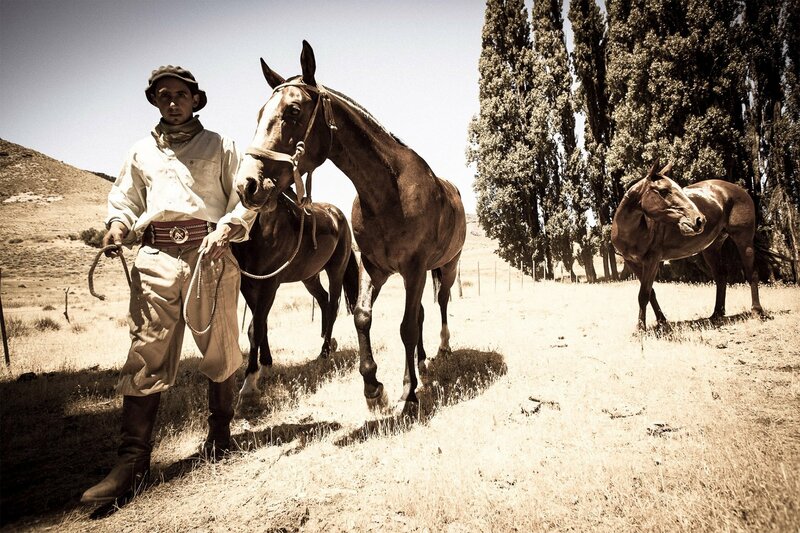 Cooled and wearing just sun-bleached head collars the horses are left free in the pampas – they won’t run from their gauchos. Mariano cradles a little white sack of alfalfa and carefully measures out 3 handfuls under the nose of each happily grazing horse. Once this ritual is lovingly completed the gauchos too settle down for a snooze in the shade. These hours give me the most solitude of my day – my body still not accustomed to daytime napping I preferred to sneak off along the riverbanks; sunshine, and lunchtime wine blurring nature with an ethereal glow. Lying next to the riverbank it was hard to tell where the long grass stopped and the drooping tree branches began. Spectacularly silent I felt tiny amongst the greatness of nature –the sun had been scorching hot and finding a hidden spot, I stripped and jumped into the water, the current pulling me towards the sun blasted fallen branches and mossy rocks which created this otherworldly pool. It was only after setting off again that afternoon that I realised how bereft of trees the landscape had previously been. Here, as if marking a new page in the adventure trees erupted like sherbet dipper sticks from the hillside. We entered a forested wonderland; luminous against the half-light startlingly bright parrots screeched past as we traversed an increasingly narrowing trail of soft brown needles. Monkey Puzzle trees dripped with branches weighed down by paint box green needles as thick as my finger and as hard as bone. Not more than an hour into this Aladdin’s Cave we had lost the path forcing the horses to push through bamboo as high as our heads. 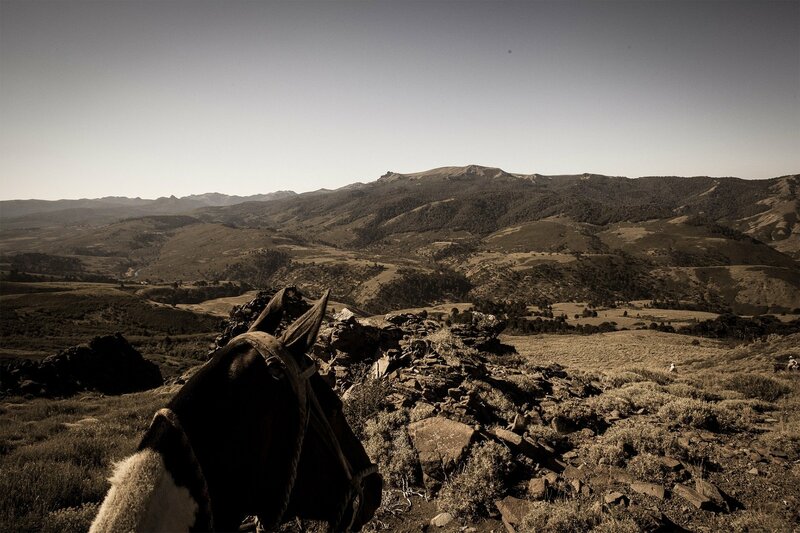 It was an extraordinary contrast to the miles and miles of flat estancia land over which I had galloped like a bandit just that morning. Reminding me yet again of the extraordinary variety of the Patagonian terrain – a mythical land of contrasts as vast as the landscape itself.